Located in the heart of the historic district of Hayes Valley, conveniently connected to public transporation and the very best of San Francisco. We were pleased to represent the new owner in the purchase of this fine property. If you are considering buying or selling real estate, please contact us at 510-290-6630. We are here to serve you. The building features two identical 2/bedroom 1/bathroom units. It offers two seperate storage areas on the bottom level that can be potentially be converted into extra living space or parking. 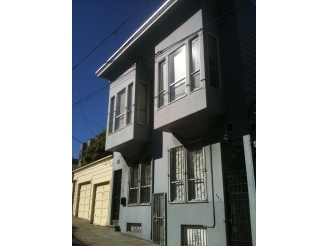 This 2-unit building is located on a quiet street in the heart of Hayes Valley. It's just steps away from world-class shops restaurants and the Civic Center BART Station.